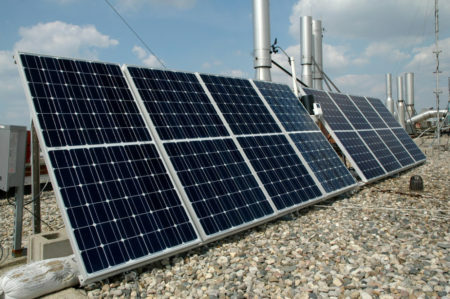 Illinois lawmakers have adopted new interconnection standards that will make the solar siting and installation process significantly quicker and cheaper, clean energy advocates and utilities say. The Illinois state standards, adopted Oct. 11, are based on a rule establishing best practices that the Federal Energy Regulatory Commission (FERC) adopted in late 2013. The standards are being held up as a model for other states, including Iowa and Minnesota, which are currently going through interconnection rule-making processes. Click to read more. Remove system size limitations to allow customers to meet all on-site energy needs. (Currently limited to 25kW). Credit net excess generation at the customer’s retail rate with indefinite rollover. (Currently credited to customer’s next bill at avoided-cost rate). Remove the aggregate capacity limit. (Currently 1% of utility’s average monthly peak demand). Freeing the Grid is produced by the Interstate Renewable Energy Council (IREC) and Vote Solar, with analysis provided by EQ Research. This entry was posted in Installation, Nebraska / Midwest News, NewsBlog and tagged Federal Energy Regulatory Commission (FERC), Freeing the Grid, Illinois Interconnection Standards, Interstate Renewable Energy Council (IREC), Midwest Energy News, Nebraska's Interconnection Standards, Vote Solar on October 19, 2016 by Helen Deffenbacher.